These homemade strawberry shortcake recipes will let you experience the authentic taste of an old fashioned shortcake. It's a dessert that can be prepared in hardly any time at all. Enjoy learning how to make it the old fashioned way, just as Grandma made it — sometimes with just the sweetened strawberries, sometimes with a white of egg meringue, and sometimes with whipped cream. Whatever way you choose to make it, it's always delicious. Ingredients: One pint of flour, measured before sifting; one teaspoonful of cream of tartar, half a teaspoonful of soda, one-fourth of a teaspoonful of salt, two tablespoonfuls of sugar, four of butter, one teacupful of milk. Mix the other dry ingredients with the flour, and rub through a sieve. Rub the butter into the mixture, and add the milk. Butter two tin squash pie plates. Spread the mixture in them, and bake in a quick oven from eighteen to twenty minutes. Mash one quart of strawberries with three-fourths of a cupful of sugar. When the cakes are taken from the oven, split and butter them, and put half of the strawberries and sugar in each cake. Serve immediately. So delicious! Three eggs, one cupful of sugar, two of flour, one tablespoonful of butter, one scant teaspoonful of cream of tartar, a small half teaspoonful of soda. Beat the butter and sugar together. Add the eggs, well beaten. Mix the soda and cream of tartar with the flour, and rub through a sieve. Stir into the beaten egg and sugar. Bake in deep tin plates. Four can be filled with the quantities given. Have three pints of strawberries mixed with a cupful of sugar. Spread a layer of strawberries on one of the cakes, lay a second cake over this, and cover with berries. Or, a meringue, made with the white of an egg and a tablespoonful of powdered sugar, may be spread over the top layer of strawberries. Includes a Master Biscuit Recipe for delicious shortcakes. Unlike the other strawberry shortcake recipes, this one has a surprise ingredient — cottage cheese. The cheese gives it a richer, cheesecake-like taste. You'll love this rich-tasting strawberry dessert. 2 cups flour, 1 tablespoon sugar, 4 teaspoons baking powder, 1/2 teaspoon salt, 1/3 cup shortening, 1 egg, milk or water. Sift dry ingredients. Work in shortening. Beat egg in measuring cup, add liquid to fill three-fourths full. Stir in. Pat dough into 2 rounds to fit pie plate. Brush one round with melted shortening. Put second round on top. Bake in hot oven (450°F) 20 to 25 minutes. Wash and hull 3 cups strawberries. Add 1 cup sugar, 1 tablespoon lemon juice. Stand 15 minutes. Save a few perfect berries. Crush the rest. Spread between shortcake layers and over top. Garnish with whole berries. Serve with plain or whipped cream. As a "surprise," add cottage cheese (or cream cheese) to whipped cream. This brings out the strawberry flavor. To the above Master Biscuit dough add 1/2 cup chopped pecans (or other chopped nuts of choice) before adding liquid. Filling: To 3 cups sliced canned peaches, add 2 tablespoons lemon juice. Serve with plain or whipped cream. Use the above Master Biscuit Recipe. Filling: Wash and cut 4 cups rhubarb. Mix with 1-1/4 cups sugar, 1 teaspoon grated lemon rind, 1/2 teaspoon cinnamon, and 1/4 cup water. Let stand 15 minutes. Bring to boil. Cook 3 minutes longer. Cool. Add 1/2 cup grated pineapple. Serve with either plain or whipped cream. Combine dates, water, sugar, lemon juice, and salt. Cook over slow fire, stirring frequently, until mixture thickens. Cool. Roll biscuit dough 1/8 inch thick. Cut with large round cutter. Remove centers from half of circles with smaller round cutter, leaving rings. Brush tops with butter, sprinkle with sugar, and place on greased baking sheet. Bake in hot oven (475°F) 10 minutes, or until done. 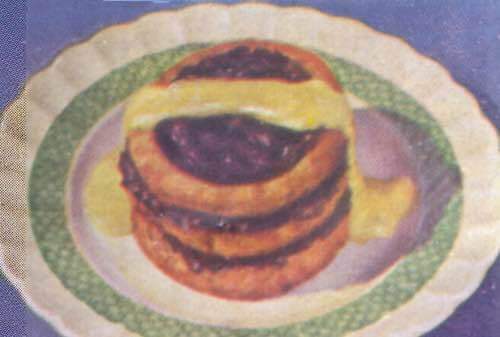 Spread each round biscuit thickly with date mixture, adjust rings on top, and fill openings with additional date mixture. Serve with lemon sauce or whipped cream. Makes about 4 individual date shortcakes. We can be certain that the good ladies of Perry and vicinity contributed their best dessert recipes when compiling their cookbook. This rich-tasting strawberry shortcake dessert recipe calls for "matzo" flour, which is readily available in most big city food stores. Beat the yolks and whites of four eggs together with a scant teacupful of sugar, a pinch of salt, and the grated peel of a lemon. Beat until the consistency of a thick batter; add last about three-quarters of a cup of matzo flour. Bake in two layers. 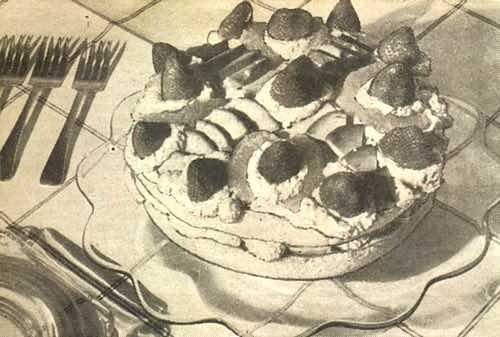 Pick strawberries, cut them in halves, sugar liberally, fill each layer (this makes two cakes); whip some very rich cream, sweeten and spread on top of the cakes. If you haven't the cream, whip the whites of five eggs with a quarter of a pound of sugar, and spread over the cakes. When a homemade strawberry shortcake recipe is from Dr. Chase's book, you know it has to be good. 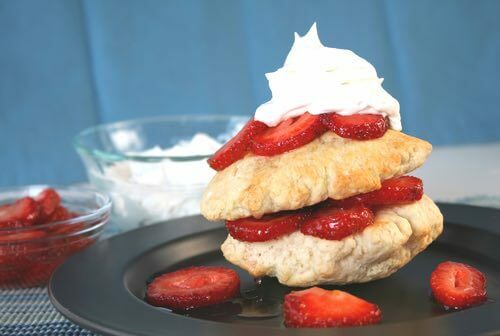 The "Old Doctor" loved his strawberries, and it has been said that shortcake was one of his favorite desserts. I'll bet he personally taste-tested each and every dish. Flour, 3 cups; butter, 3 tablespoonfuls; sour cream, or rich clabber (milk becoming thick), 1-1/2 cups; 1 egg; sugar, 1 tablespoonful; baking soda, 1 teaspoonful; salt, 1 teaspoonful. Directions: Dissolve the soda in a little warm water and add it and the beaten egg to the milk; having put the salt in the flour, cut the butter in small pieces, and work it in smoothly also; mix all, handling as little as possible. Roll quickly and bake in a hot oven. The soda and sour cream will take care of the rising. Prepare the dough as for biscuit, doubling the amount of butter; roll out to make a cake of good thickness; let rise and bake in a quick oven. Make the cake as for the sweet shortcake above, but roll in 2 sheets, 1/2 an inch thick for the upper, the lower less; spread a very little butter upon the thin one, placing it in the pan, put the other upon it, and bake. When a little cool, lift off the top one and place a good layer of strawberries upon the other, and replace the top, spreading as many berries upon the top as will lie; serve with sweetened cream or milk — of course, the first is the best. Mix as for biscuit, roll about 1 inch thick, and bake. 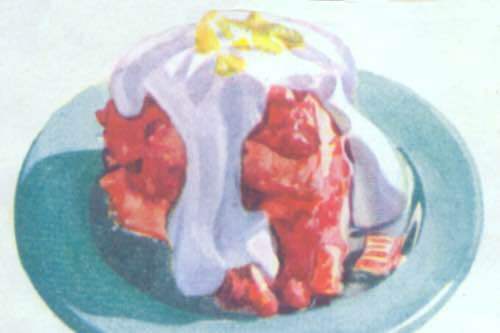 When done, have the strawberries mixed with sugared cream; split the cake with a sharp knife, spread lightly with butter the lower half, then put in a thick layer of the fruit, replacing the top, and covering the top also. Some persons then replace in the oven for a few minutes; but this, I think, makes it more like pie than fresh-berry shortcake. Other berries or pie-plant [rhubarb] may be used, but pie-plant must be stewed, and no cream used. "I believe the Household, and the editor will agree with me in thinking Puck never ate any strawberry shortcake. 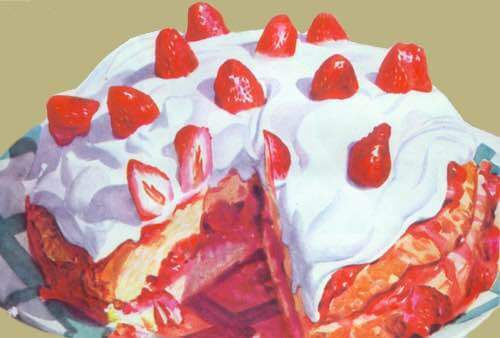 We are 50 years old, but don't we remember, as well as if it was but yesterday, the dear, delightful ones made by mother in our childhood, and don't we know just how they were made, too; we heard her tell so many times, as everyone wanted her best strawberry shortcake dessert recipe. Remarks. —The author loves all these aunts, because they know how it is done; but he would love them better if they were not ashamed of their real names. This is about as my own mother used to make them, so I know it will prove good and worthy to be followed by all who have the nice "sour cream." But good rich milk with soda — no cream of tartar — will do very nicely. If you would like to try a shortcake dessert recipe, but know that strawberries are unavailable, then this recipe for apple shortcake may be a delicious alternative, especially in the fall when the apples are in season. Apple shortcake made this way is really good. 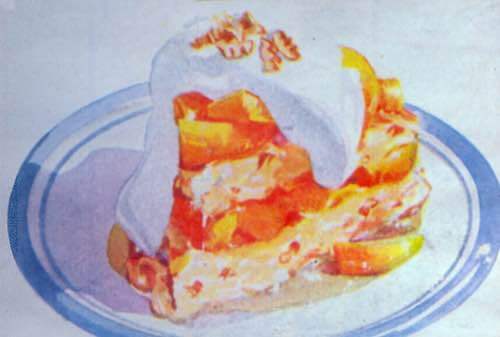 Season well-stewed applesauce with sugar and nutmeg, or mace; make any of the nice shortcakes, above given, open, or split, as the case may be, butter nicely and spread on a thick layer of the prepared sauce, and replace the top; serve with well-sweetened cream. Remarks. —You will need to have quite a quantity, if you satisfy the taste and desires of the family, and the guests. Popular everywhere strawberries are known! Sift the flour, baking powder, sugar, and salt. Cut in the shortening; add the beaten egg to the milk, and add to the dry ingredients to make a soft dough. Divide and smooth out lightly. Bake in greased deep layer tins in a hot oven for twenty to twenty-five minutes. Split and spread between layers with crushed and sweetened berries. Cover the top with whipped cream and whole berries. Dust with powdered sugar, and serve. 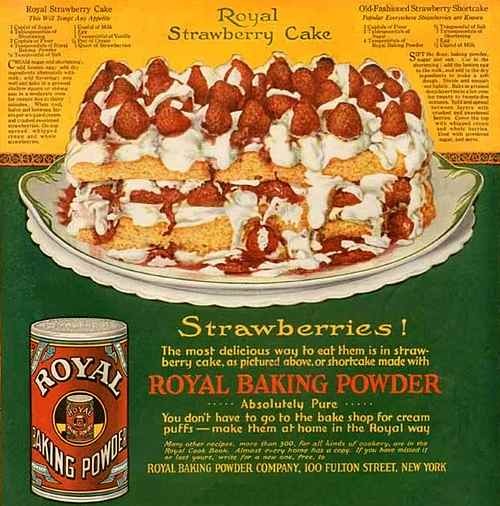 A couple of Dr. Chase's old fashioned strawberry shortcake recipes say to "prepare the dough as for biscuit," and this historical biscuit recipe taken from his cookbook will serve as a fine example. Some swear it makes them better than Bisquick®! In Dr. Chase's day, it was not unusual for shortcake to be made using biscuit dough, and it's delicious when made this way and served with the traditional sweetened cream. Try it and see. Flour, 3-1/2 cups; baking powder, 3 teaspoonfuls; butter, or nice lard, 1 tablespoonful (rounding); sweet milk. Directions: Stir the baking powder into the flour and sift; work in the butter smoothly; then use milk enough to have a soft dough; mold into biscuit by using flour, dusting freely; bake in a hot oven at once. Remarks. —Do not knead biscuit made with baking powder, nor make them stiff, in this lies the secret of making nice, light biscuit with baking powder; so says "my good woman," and she knows from an experience of 40 years of married life. In cold weather the butter will work in easier, if warmed. Water may take the place of milk by doubling the amount of butter or lard, to make them equally rich. Here's an easy dessert idea. A plain Strawberry Shortcake recipe becomes Strawberry Shortcake Supreme simply by adding halves of canned pears and fancy cookies to the top decoration. Other fruits such as raspberries, cherries, blackberries, banana, peaches, oranges, and even canned fruit can be substituted for strawberries. Grandma's homemade strawberry shortcake recipes make one of my favorite desserts. Try to imagine the taste of freshly made shortcake piled high with garden-fresh strawberries and homemade whipped cream. No tasteless store-bought sponge cake and artificial topping here. This is the genuine article! It's the same strawberry dessert that your great-great-grandparents enjoyed at strawberry church socials and family reunions. Please don't take the quick route and settle for second-best. Get yourself some fresh strawberries, choose one of these old time recipes, and treat yourself to something truly special. Strawberries taste best when they're freshly picked, but if you cannot obtain fresh berries, frozen or preserved berries can be used in a pinch. 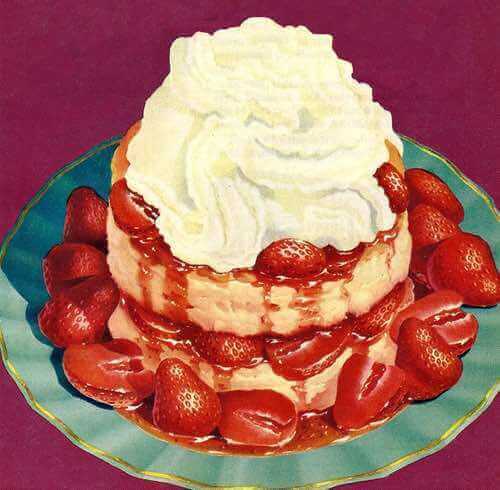 Enjoy one of these vintage shortcakes today. I love all those strawberry recipes. Thank you! It's a shame strawberry season is so short.